East Penn Foot and Ankle is sponsoring the Iron Pigs i-Run 5k and Piglet run September 16th at Coca-Cola park in Allentown. The race is open to runners, walkers and kids under 12 (Piglet run). More information and registration for the i-Run Pigs 5k is here. This post is for Piglets (kids under 12) and Walkers. Whether you’re running or walking, we want you to join the East Penn Foot and Ankle team! Details on how to race for free are here. No one should ever start a 5K cold. Just because you’re not running, it doesn’t mean you shouldn’t warm up and condition your muscles before the race. For some, walking 3 miles/5k is a breeze – a literal walk in the park. For others, it will be strenuous activity. In either case, you should condition your body beforehand with a proper diet, a stretching routine and a practice course. And it goes without saying that you should wear a good pair of athletic shoes. Even though you’re not training for a marathon, our diet plan for runners is the best way to get the proper balance of nutrients your body needs to perform. It’s also very low in fat and high in protein. Say no to all fast food and focus on fresh food prepared in your home. When you prepare it yourself, you know what you’re putting in your body. Stretching exercises warm up your muscles, which makes them less likely to strain during exercise (or any other time). Stretching also strengthens your muscles, so it’s a simple way to take care of your body. Learn some basic stretches on our exercise page. Know what you’re in for by charting a 3 mile course around your neighborhood or a favorite park and walk it a few times before race day. If you’ve been sedentary for the past year, the amount of effort required may surprise you. As we age, or if we have a health crisis, it becomes more difficult to stay in shape and to get back in shape, and we assume we can do the same exercise routine as we did previously… until we can’t. So take things slowly and ease yourself into it. Start walking today. Whether your child is active or sedentary, they should know what to expect on race day. Children frequently overestimate their physical abilities, so have them tag along with you on your course a time or two before the race. The Piglet run is only one mile, so if they can comfortably walk your course, they should be able to do the Piglet run. Walking will also help to warm up and condition their muscles. Running is the simplest form of exercise for a child and the competition between the kids helps to build confidence. Keeping their bodies fit while young will serve them well as they grow into adulthood. ***Health check: If you have a history of heart disease, obesity or lung ailments, please check with your physician before training. Win a free registration for the i-Run Pigs 5K! 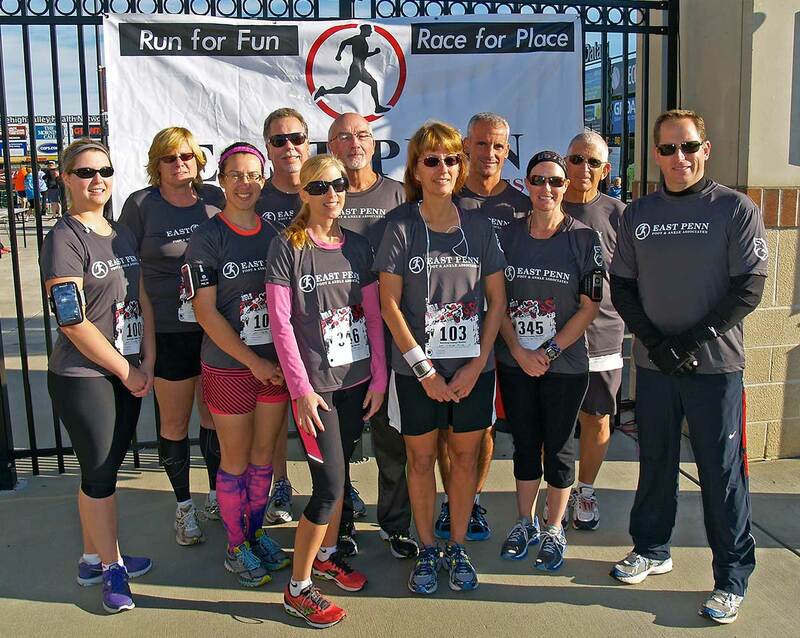 Would you like to be part of the East Penn Foot and Ankle team in the i-Run Pigs 5k? If you are in good health, can run or walk about 3 miles (5K), and are willing to wear an East Penn Foot and Ankle t-shirt in the race, we’d like to hear from you. The i-Run Pigs 5K will be held on September 16th at Coca Cola Park in Allentown and the proceeds benefit Iron Pigs charities. There is also a 1.5 mile piglet run for kids under 12, so it’s a real family event. To enter, please send an email to heftmedia@gmail.com with “i want to i-run” in the subject line. Include your name, age, address, health status, and email address in the body of the email. Deadline to enter is September 9, 2012. We’ll be giving away 5 registrations to winners chosen at random from all entries received (a $28 value). We’ll contact you by email if you’re chosen to be one of the team. More information on the i-Run Pigs 5k is on the Lehigh Valley Iron Pigs website.